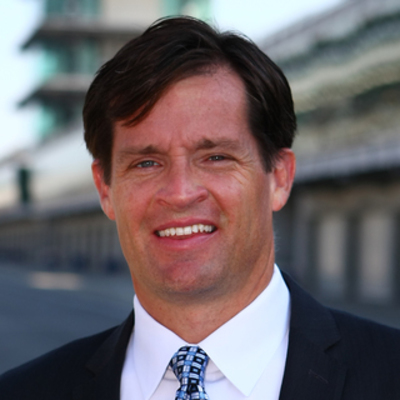 J. Douglas Boles was named president of the Indianapolis Motor Speedway Corporation in June 2013. He is responsible for the daily operations of the Indianapolis Motor Speedway and all four world-class racing events at the facility – the Indianapolis 500 presented by PennGrade Motor Oil, the Indycar Grand Prix, the Brickyard 400, and the Red Bull Air Race. He also is responsible for exploring and expanding business opportunities for the Speedway. In 2017, IMS hosted more than 275 event days of activity, including the newly created Lights at the Brickyard holiday experience that started in 2016. Boles served as chief operating officer of the Indianapolis Motor Speedway from January-June 2013 along with his role as vice president of communications for Hulman & Company, which he assumed in November 2011. Boles joined the company in November 2010 as IMS director of public relations after more than 15 years of executive-level motorsports experience in team operations, marketing, sponsorship and public relations. During his time as president, Boles oversaw the investment of over $100 million in the highly publicized Project 100 renovation of the 108 year old venue, the largest sporting venue in the world and the implementation of the 100th running of the Indianapolis 500. He and his team also secured and executed the first ever, standalone music event at IMS when it played host to the Rolling Stones on July 4, 2015. Recently, IMS secured a multi-year agreement to host an LPGA golf tournament beginning in 2017 at the facility’s Pete Dye designed golf course. A Butler University graduate who also earned a law degree from the Indiana University School of Law at Indianapolis, Boles served as executive vice president of the marketing and advertising agency ignition, Inc., from 2006-08. He then became partner in the marketing agency i3Worldwide while conducting his own private law practice, primarily representing drivers, race teams and sponsors. The Indiana native was a founding partner of Panther Racing, at the time one of the IndyCar Series’ most successful teams, and served as a co-owner and team chief operating officer from 1997 until early 2006. Boles also served as director of governmental and corporate affairs for Indianapolis Mayor Stephen Goldsmith from 1992-97, where he also spearheaded the nation’s first government-led effort to attract motorsports companies and jobs to a community. Boles serves on the boards of INDYCAR Ministry, 500 Festival, United States Auto Club, and Motorsports Hall of Fame. He has previously taught courses at his alma mater, Butler University, and was selected as a member of the first group of “50 Under 50” highlighting Butler graduates. Boles and his wife, Beth, live in Zionsville. They have four children.